When managing a project with several other people, it is very important to keep track of tasks and actions related to the project. These things can be lost when projects get stressful or when there just seems to be so much to do. Keeping record of these parts of a project, the phase of the project these should be done within and completion information is easily recordable in this project planning checklist template for Microsoft Excel. Click Download to download the free template to your computer from this page. Open the file immediately or save the file to your computer for future use. After you have downloaded the template, you can set it up for project team members to use to record their work. Open the file. Note that one worksheet should be created for each member of the project team within the workbook. To do this, copy the existing project planning checklist, and create a new worksheet for each team member. On each worksheet, enter information for the team member and the deadline for the entire project. 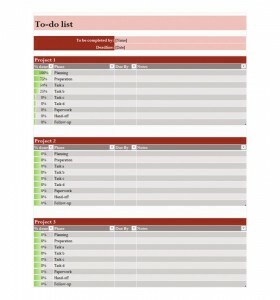 Enter project and task information for each project within the checklist. Save the file. You may want to save it in a location accessible by all team members or send each team member his or her own worksheet. After you have set up the project planning checklist, project team members can begin using their section of the workbook. Update the percentage complete column, as needed. Add any new phases, tasks or notes, as needed. Note that columns can be sorted and filtered to view certain information more easily. This easy-to-use template offers a starting point for keeping track of project information. It can be customized for optimal use with additional columns, rows, worksheets, color preferences and other Excel features. Ensure the compatible version of Microsoft Excel is installed on each computer on which this template will be accessible.